» Meet Blueball Reactive - Our new responsive mobile-friendly design! Meet Blueball Reactive - Our new responsive mobile-friendly design! 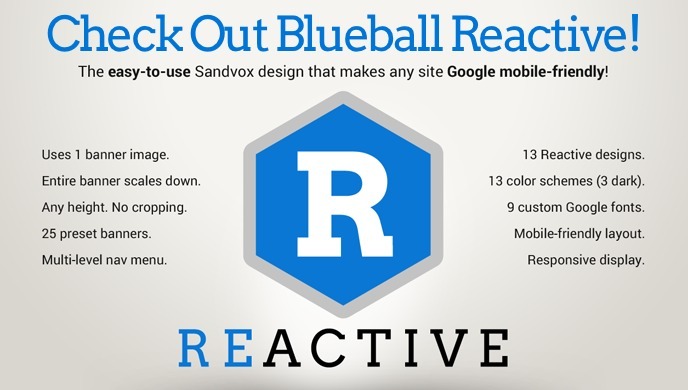 Hot on the heels of our first ever responsive Sandvox design release, we are proud to announce the release of our second new responsive mobile-friendly Sandvox design - Blueball Reactive! Let us know what you think about our Blueball Reactive design, and any questions you may have on it features. Also send us your site urls when you publish your Reactive Sandvox site so we can check them out. As always, thanks for your continued support of our Sandvox designs! It is very much appreciated. Re: Meet Blueball Reactive - Our new responsive mobile-friendly design! In my situation on a skinny, chancy 3G modem connection, I cannot rely on internet support when I am working with these designs so I have downloaded and installed the fonts on my MBP so I getf a fair representation in Sandvox of what the site will look like on the internet. I cannot see the banners until I publish the site, but that's no problem, really. It is quite clear what they will look like once the site is published and the position for them is quite clear.